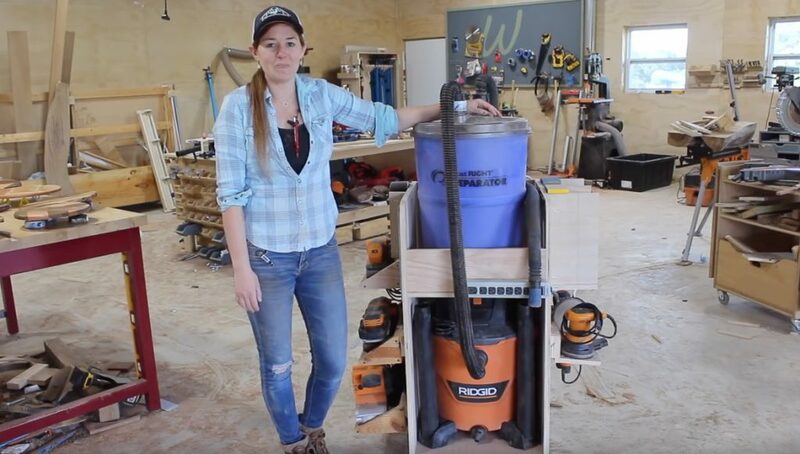 Toting around my shop vac and my separator anytime I want to use dust collection with my power tools is such a pain, so this week I built this cart to simplify things for me. If you’re new to this hobby then a quick overview for you is: breathing in dust is bad. 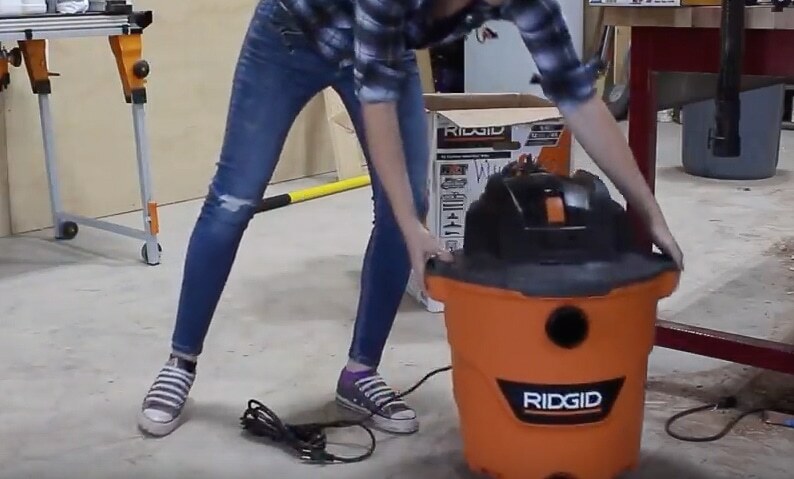 One way to control it is to hook a shop vac directly to your tool when you’re using it. This sends all the dust through the filter of the shop vac and the shop vac collects it. A great add on to this set up is a cyclone or a separator. 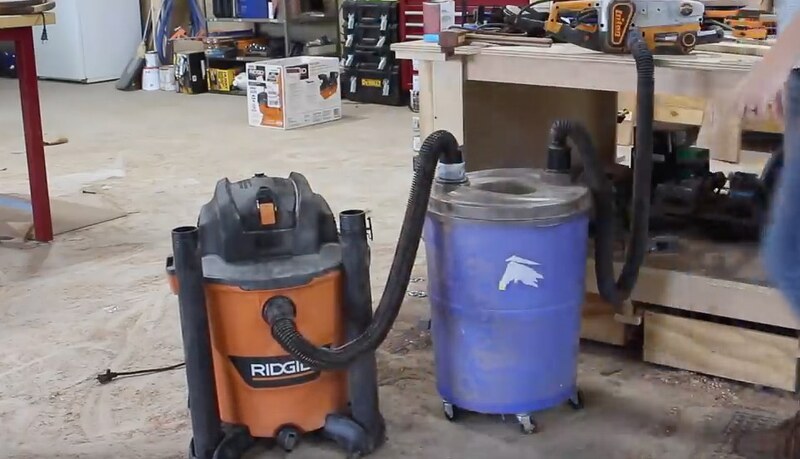 I have the Dust Right Separator where I hook up a hose to my tool that feeds into the separator, then the separator feeds into the shop vac. 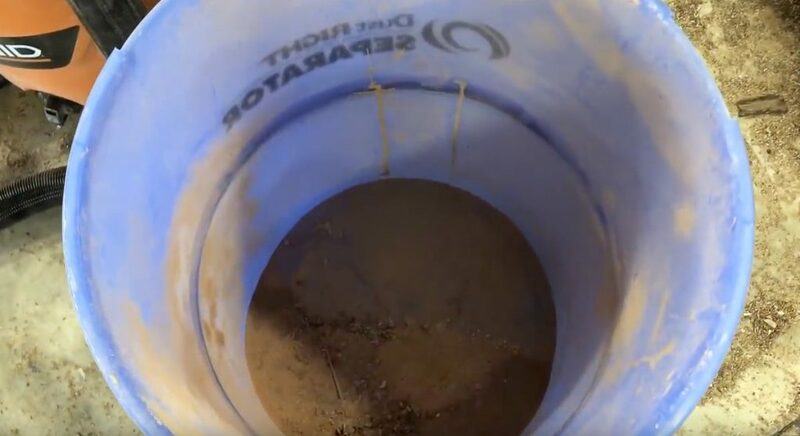 This separator collects the majority of the saw dust that I create, leaving only the finer saw dust to go through the filter of the vac and be collected. This is my preferred set up. However, getting back to the irritation, it’s a pain to haul both of these individual units around the shop to where I’m working. So this week I designed a storage solution to simplify it. I decided to go ahead and upgrade my shop vac while I was building something. 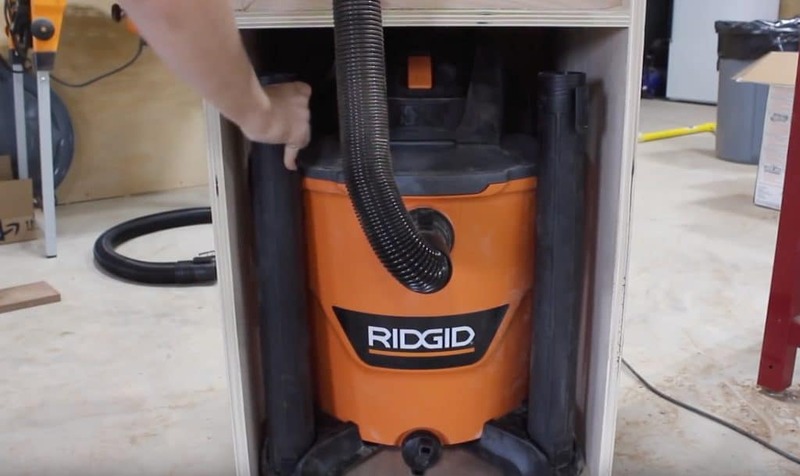 I’ll be using a RIDGID 12 gallon 5hp wet/dry vac. It’s pretty much the same height as my separator. I played around with designs and decided to make a taller cart than I originally planned, with a smaller footprint. 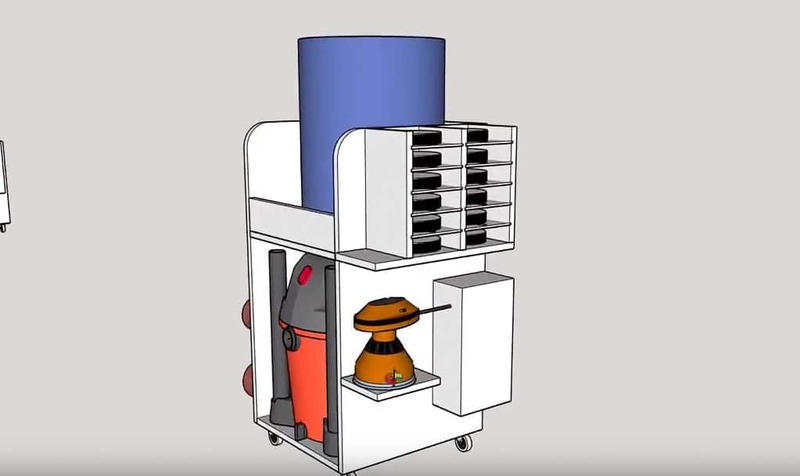 This is an option with the units stacked, with the hose going straight out from the vac up to the separator. I still had room for the sanders on the left and the ROS’s on the right, but then broke up the sandpaper storage to go on both sides in order to make it all fit. Having these design changes and options is exactly why I love taking the time to model my projects before starting. Ok now that you see what I’m going after, lets build it. 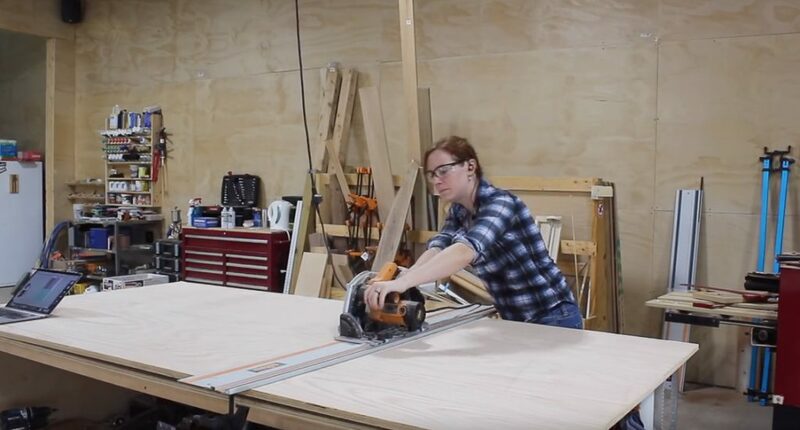 I’m building it from one sheet of 3/4” plywood so I started by wheeling a sheet over to my workbench and breaking it down with my track saw. Once I had things at a more manageable size, I took those sheets over to the table saw and broke them down to their final size. And just a tip for you: whenever I’m working off a cultist, after I cut a piece to size I label the edge so I won’t get it mixed up with the other parts of the build. To start joining things together I grabbed the back and one of the sides then used the aid of these right angle clamp it jigs to hold both together at a 90. This makes it easy to go through and predrill then attach with screws. After getting one side attached, I repeated the process for the other side. Next I flipped it on it’s back and attached the bottom. Oh and I’m using Titebond original for this project. Next I attached the shelf in the same manner. I first measured on where it needed to go then made marks on the front and back on both the side pieces. 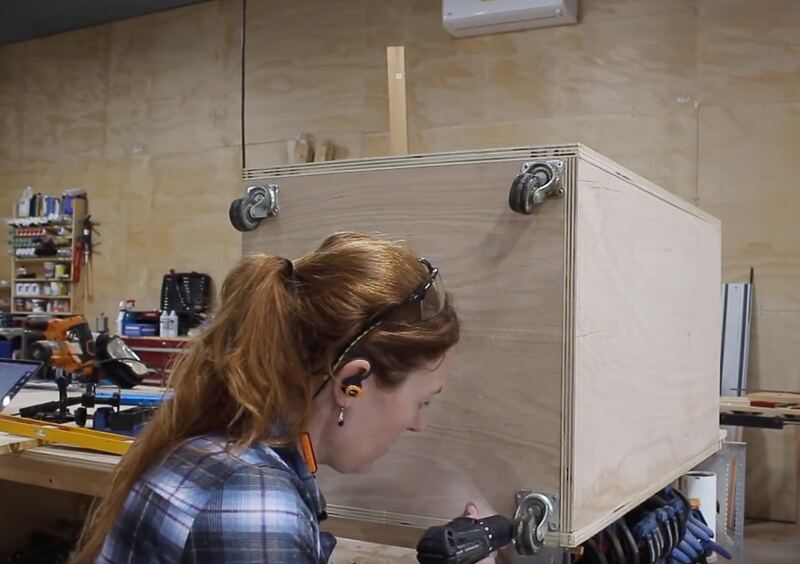 Before securing it with screws, I also use a square just to make sure everything looked good. 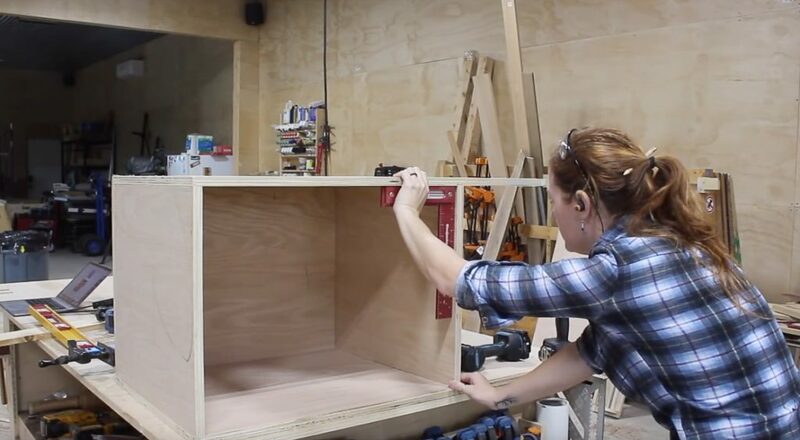 Once I had the two front corners pinned, I used the square to draw a line down center so I could pre drill and screw the back of the shelf into place. After repeating on the other side, I quickly attached four casters to the bottom to make this unit mobile, then set it on the ground to test out. Separator goes on top, shop vac on bottom. 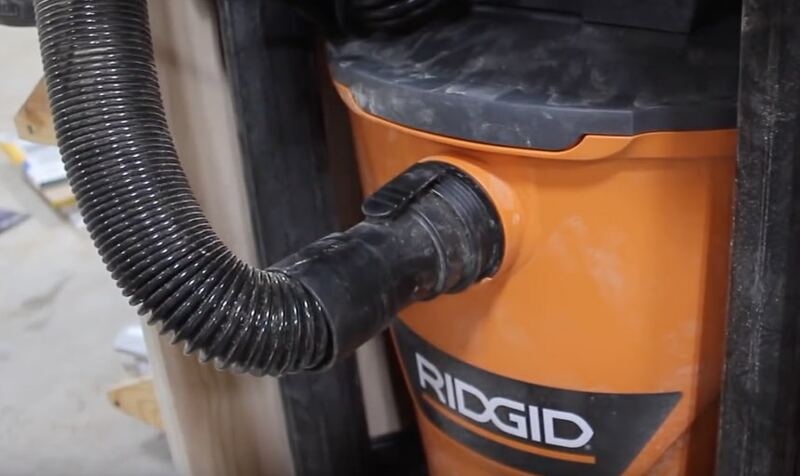 The hose as well as all the attachments have a quick connect feature which will make not only connecting the hose but also disconnecting it to clean out the vac, quick and easy. I thought I would have to build in some holders to store the vac attachments but RIDGID actually incorporated a storage method in the feet! So that’s handy and saves me a step. 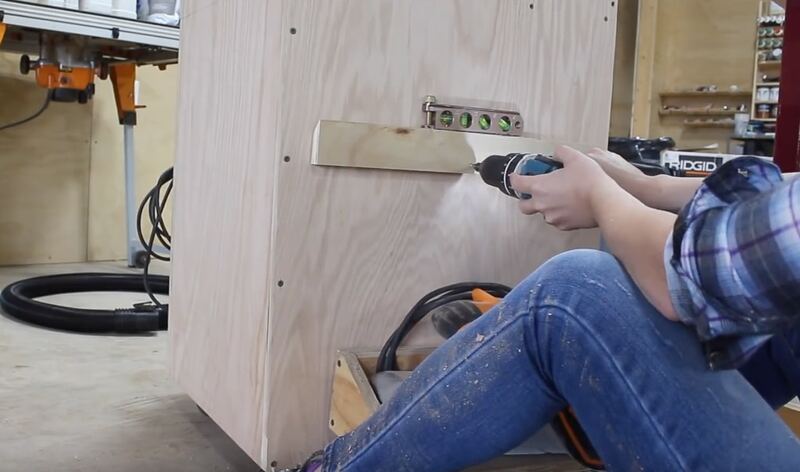 Now the reason the separator is on the top is because it’s the portion that is connected to my power tool and I wanted it to have the ability for it to pivot around along with me instead of being confined inside the lower cubby. That’s also the reason I left it on casters. To keep it from falling off the shelf however, I placed a front lip in between the two sides. And you can see that if this end is connected to my tool, I can go pretty much anywhere and the separator will rotate around with me instead of me having to rotate the cart. 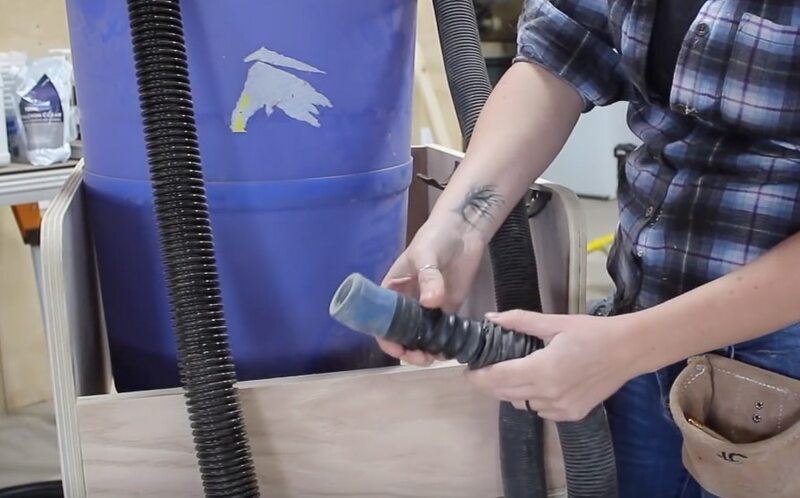 The shop vac comes with these handy hose holders with the intention of giving you an onboard place to store it away when you aren’t using it. However, since it isn’t needed on the vac in my case, I repurposed them to hold my smaller hose from the separator instead of just tossing it inside the top compartment. This will keep the hose conveniently placed for easy grab and use. 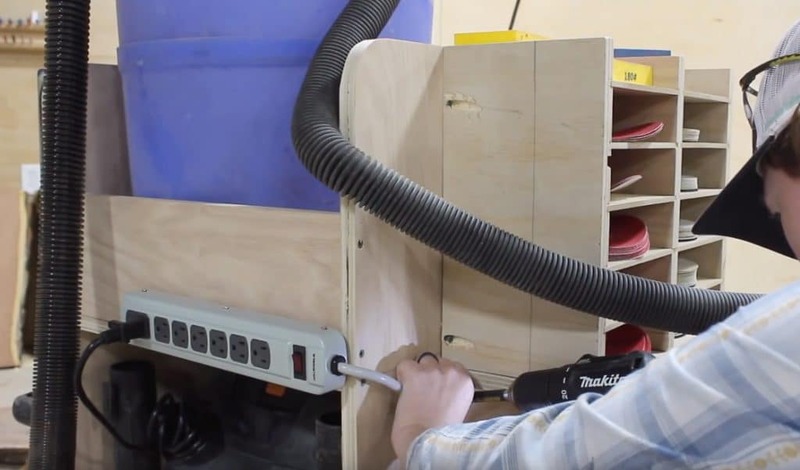 I’m not incorporating any extra hose storage on my unit because I use this Rockler small port hose kit….which is a flex hose that is a stock diameter but comes with thread-on connections that are interchangeable. So instead of swapping out the entire hose to fit different ports on my tools, I just switch out the thread ons. 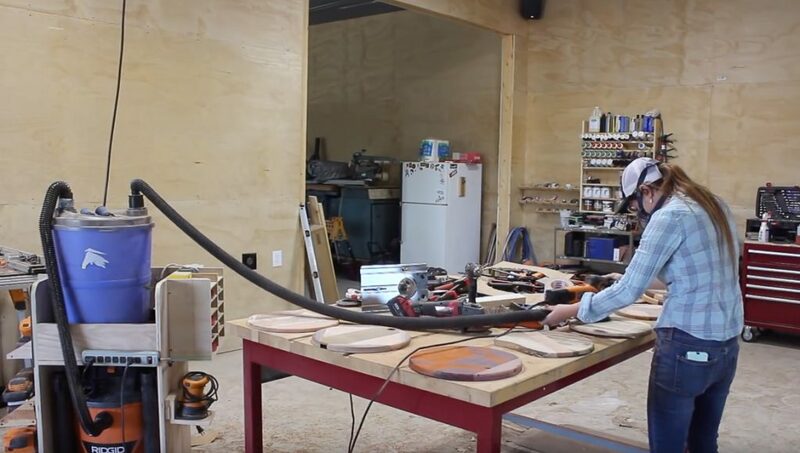 Ok let me pause and explain my thinking for this next part: I most often pull out the shop vac and separator when I’m running one of my five sanders and in most projects I never just use one. Instead of making lots of trips to grab my sanders from my French cleat tool wall, then having to put them back, I decided to place all my sanders on this cart. So that’s what I did next. Since I already built holders for these tools it was as simple as grabbing them off my wall and placing a cleat on the side of the cart. My buddy Jay Bates built a similar cart for a vac and separator a few years ago but he went with a much lower profile body. 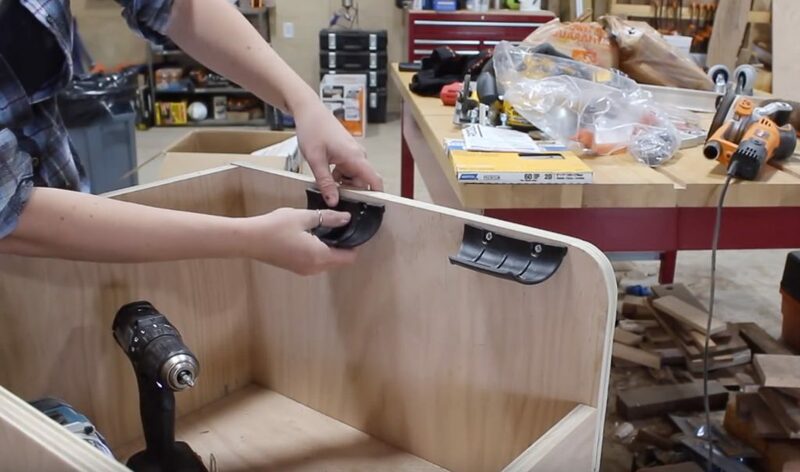 So if you aren’t interested in all the side storage then I recommend checking out his plan here. 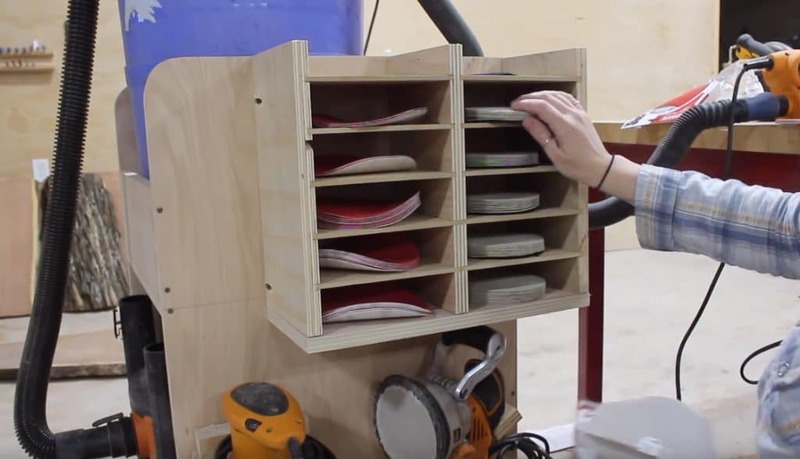 Since I’m storing my sanders, I also wanted to keep some sort of sandpaper storage here. 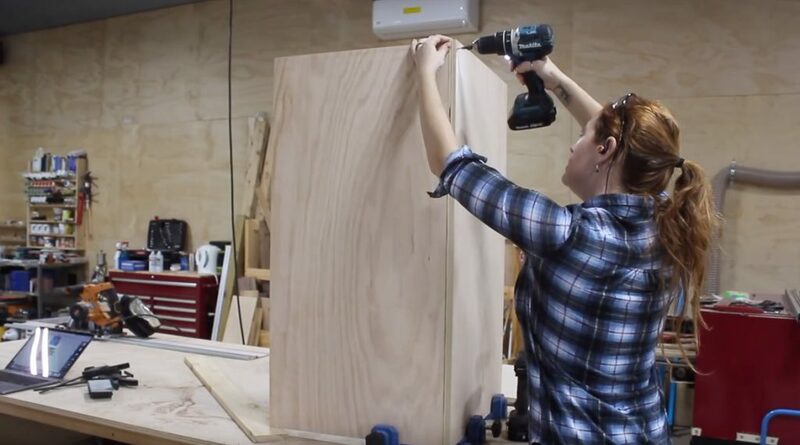 I grabbed a piece of 3/4″ plywood that was wide enough to make up both of my sides. 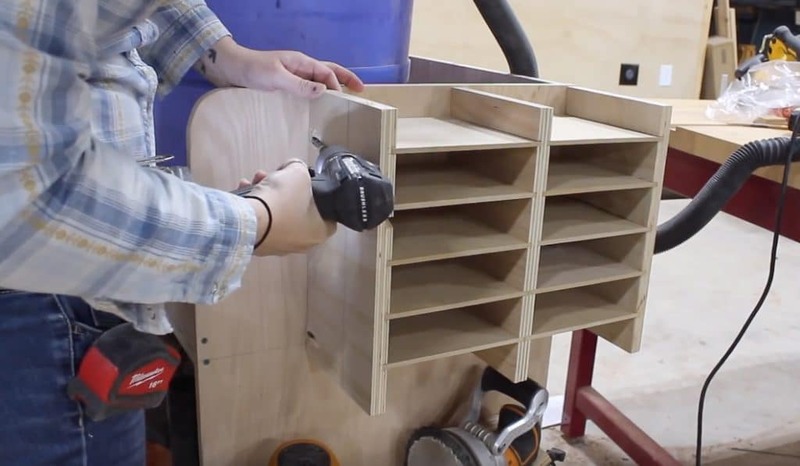 I then changed out my dado stack for a 1/4″ stack and cut a bunch of grooves. After getting those cut, I changed back my blade to a single black and cut this board in two down the middle in order to create the two sides needed. 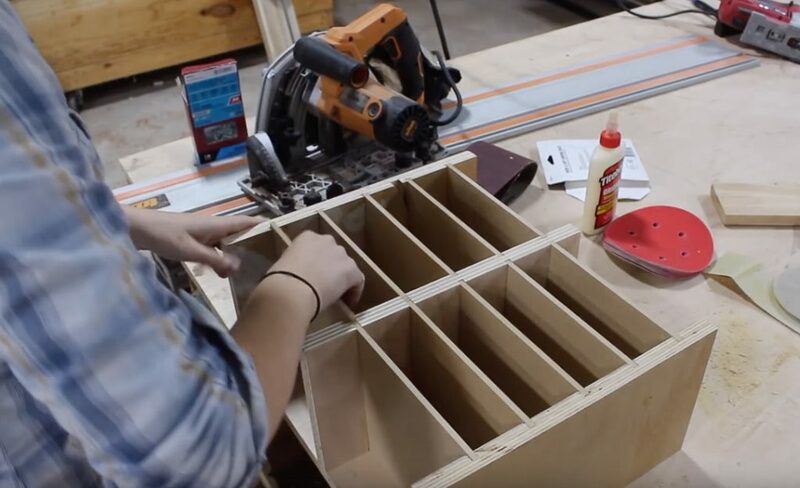 With the body done, I grabbed some 1/4″ scrap material, cut it to size and then glued them in place to make the shelves. After the glue dried, I did some sanding and then hung the sandpaper storage up. Instead of a French cleat on this one, I opted for pocket holes to keep the profile slim. 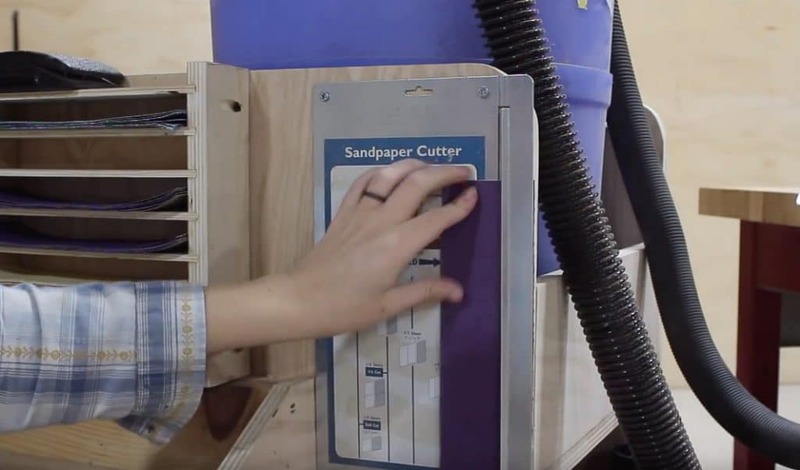 I was about ready to call this project done when I stumbled across a sandpaper cutter made by Rockler that I thought was so cool. So I put it up on my cart as well, next to my flat sandpaper. 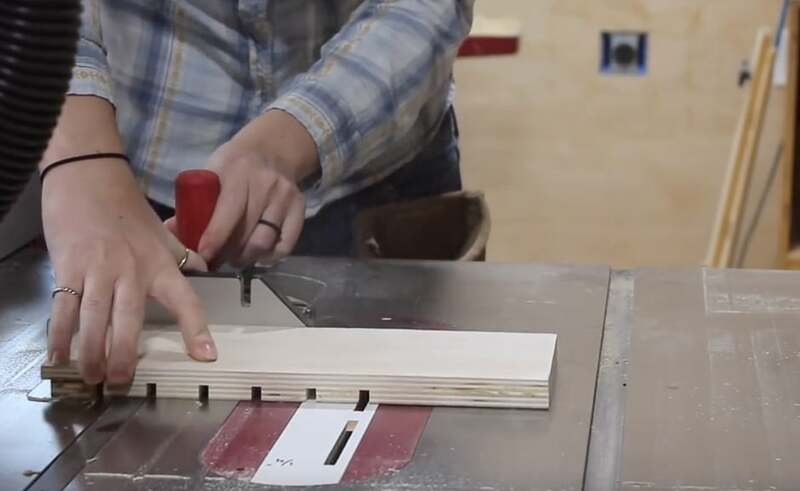 Now whenever I have a sheet of flat paper that needs to be torn to size for my sanding blocks, all I have to do is stick it into the holder, line up the side of the paper to the depth gauge, and then just rip it. The last thing I included was a power strip. 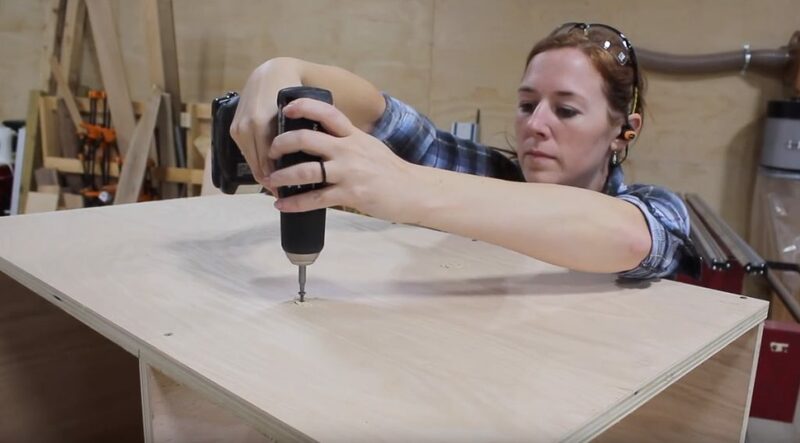 I originally wasn’t going to, I was just going to drill a hole in the back of the unit for the plug of the shop vac to pass through. However, I liked the idea of plugging the power strip into my cord reel, then being able to plug any of my sanders into the power strip instead of also having to run them to my cord reel. So main power comes in here, then I have plenty of outlets to run the tools that are being used with the shop vac cart. 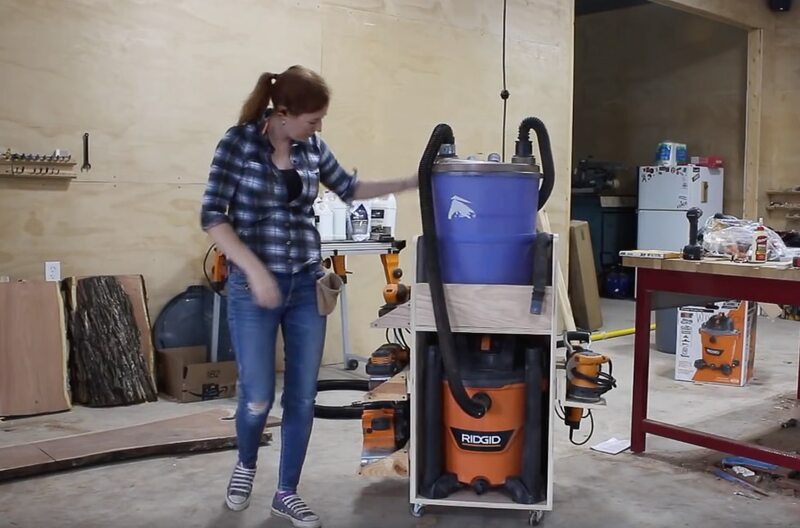 This cart definitely simplifies moving both of these units around. That’s it for this one. I hope this project helps you out. See you on the next build.